 Pay Per Click (PPC) is an advertising model used on search engines where advertisers only pay when a user actually clicks on an ad to visit the advertiser’s website. Advertisers bid on keywords they predict their target market will use as search terms when they are looking for a product or service. When a user types a keyword query matching the advertiser’s keyword list, or views a page with relevant content, the advertiser’s ad may be shown. These ads are called a “sponsored link” or “sponsored ads” and appear next to or above the “natural” or organic results on search engine pages, or anywhere a webmaster/blogger chooses on a content page. Google AdWords and Microsoft Advertising are the largest network of Pay Per Click operators. Minimum prices per click, often referred to as Cost Per Click (CPC), vary depending on the search engine, with some as low at $0.05. Very popular search terms can cost much more on popular engines. Pay Per Click advertising was once open to abuse through click fraud, but Google and other Pay Per Click operators have implemented strong automated systems to guard against this. Weblinx will manage a Pay Per Click advertising program for your business through both Google AdWords and Microsoft Advertsing services. Following the initial set up, Weblinx will perform bi-monthly maintenance checks to ensure the keywords are getting the most exposure and visitors are clicking through to your website. The ongoing maintenance fee starts at $150.00 per month. If we find that the keywords are not working or getting clicked through, we will adjust those phrases to ensure optimum results. In order to get your Pay Per Click advertising program started, set up an account with both Microsoft Advertising and Google AdWords. Once the accounts are established, provide Weblinx, Inc. with the log in information to each account. For a local campaign, Weblinx recommends a starting point of $250.00 per month per service. For a regional campaign, we recommend a starting point of $500.00 per month per service, and for a national campaign, a minimum of $1000.00 per month per service. These numbers may be tweaked as your Pay Per Click program continues and for seasonal or event focused advertising campaigns.